Department of Philosophy meeting in Room 204 from 12:30-2:00 p.m. The Library will be closed on Monday, January 19 in observance of Martin Luther King, Jr. Day. The Center for Peace and Justice Education invites you to a talk by the 2015 Dr. Martin Luther King, Jr. keynote speaker Bryan Stevenson on Tuesday, Jan. 20 at 5:00 p.m. in the Villanova Room in the Connelly Center. According to sales figures and trends, the physical book is a resilient warrior in the era of e-books after all–as if we ever had any doubts. 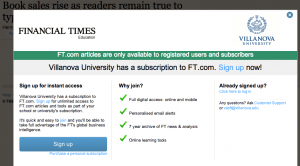 Read the article on Financial Times. 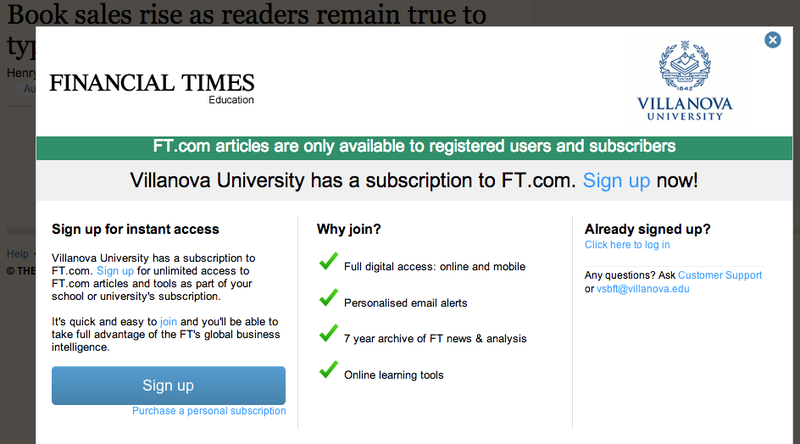 Villanova subscribes to Financial Times, so to access the article, click “sign up” on this pop-up and, well, sign up. Bam! Access granted.